Use too much force and you are going to jail. Use too little force and you’re in for a world of hurt. If you do not know how to succeed at all six levels there are situations in which you will have no appropriate options. More often than not, that will end badly. A Comparison of Martial Arts Training & Real-World Violence. The last section deals with the aftermath—the cost of surviving sudden violence or violent environments, how it can change you for good or bad. It gives advice for supervisors and even for instructors on how to help a student/survivor. You'll even learn a bit about enlightenment. This book stands alone as an introduction to the context of self-defense. There are seven elements that must be addressed to bring self-defense training to something approaching ‘complete.’ Any training that dismisses any of these areas leaves you vulnerable. 4. Counter-ambush. If the student didn’t see the precursors or couldn’t successfully avoid the encounter he or she will need a handful of actions trained to reflex level for a sudden violent attack. 6. The fight itself. Most martial arts and self-defense instructors concentrate their time right here. What is taught just needs to be in line with how violence happens in the world. In a free and peaceful society where so many have been taught that all violence is wrong, citizens are often confused and dismayed when officers use force, even when the force is perfectly lawful and justified. SECTION 1. TRAINING. I explain policy and laws that officers are taught. We examine use of force, how to define a threat, and the difference between excessive force and unnecessary force. SECTION 2. CHECKS AND BALANCES. This section explains how an officer's decisions are examined if suspected of being bad decisions. SECTION 3. EXPERIENCE. We explore how officers see the world that they live in. Somewhere in the fog between training and experience, the officer has to make a decision. Sometimes decisions will be made in a fraction of a second and on partial information. Sometimes a decision will change the lives of everyone involved—forever. SECTION 4. ABOUT YOU. Review what you should have learned. Why does community action fail? What is it that can really be done? Know how to behave when faced by an officer. Until this section, I have tried to put you in the headspace of an officer, giving you an overview of his training and a taste of his experiences. Now I will try to let you feel like a suspect. That's a lot of mind bending for one book. Get plenty of sleep and drink lots of water. 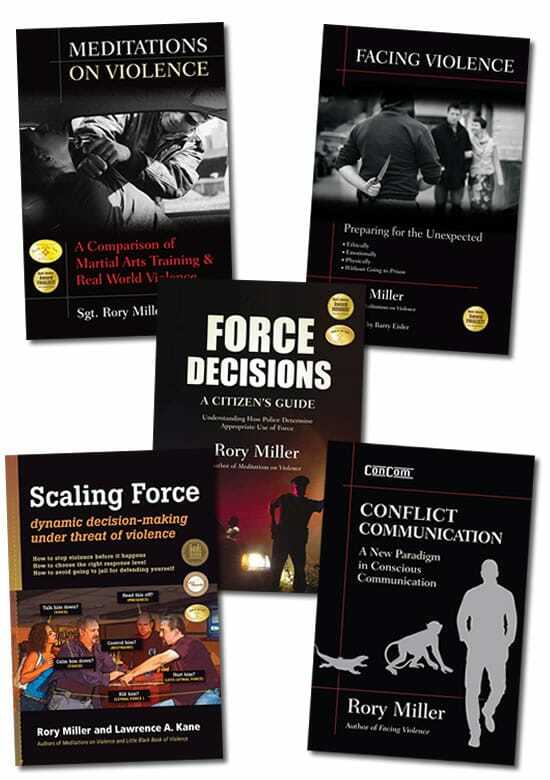 Any civilian, law enforcement officer or martial artist interested in self-defense, or anyone wanting to understand the duties and responsibilities of civilians and police officers needs to read this book. Use too little force and you're in for a world of hurt. Conflict and violence cover a broad range of behaviors, from intimidation to murder, and they require an equally broad range of responses. A kind word will not resolve all situations, nor will wristlocks, punches or even a gun. In Scaling Force the authors introduce you to the full range of options, from skillfully doing nothing to applying deadly force. They realistically guide you through understanding the limits of each type of force, when specific levels may be appropriate, the circumstances under which you may have to apply them, and the potential cost, legally and personally, of your decision. Level 1— Presence. Staving off violence using body language alone. Level 2 – Voice. Verbally de-escalating conflict before physical methods become necessary. Level 3 – Touch. Defusing an impending threat or gaining compliance via touch. Level 4 – Empty-Hand Restraint. Controlling a threat through pain or forcing compliance through leverage. Level 5 – Less-Lethal Force. Incapacitating a threat while minimizing the likelihood of fatality or permanent injury. Level 6 – Lethal Force. Stopping a threat with techniques or implements likely to cause death or grievous bodily harm.